Upon arriving in Japan, Chris wasted no time immersing himself in Japanese culture. 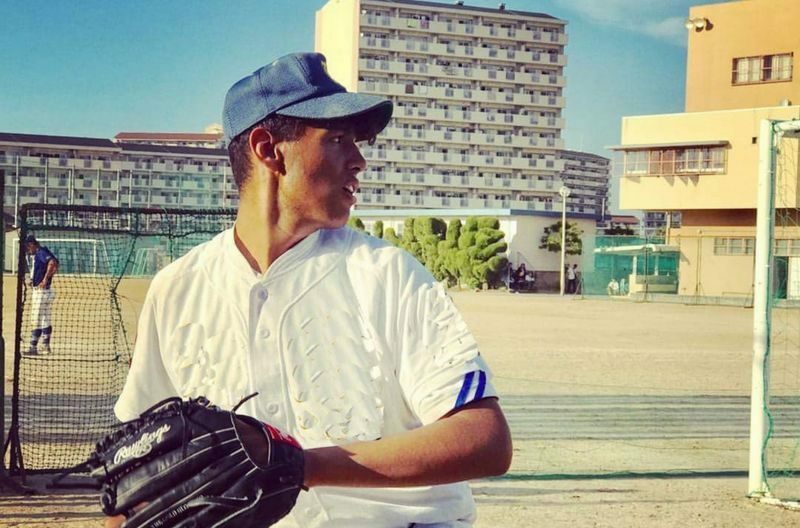 He stayed with his host family and got involved by joining his host school’s baseball team. He was surprised by how seriosuly baseball is taken in Japan. His practice schedule was even more rigorous than in the U.S. He barely had a day off! All that hard work paid off, however, because his baseball team was ranked the fourth-best in the entire Osaka prefecture! Gift from his baseball team with his name in Japanese! Once baseball season ended, Chris had more time to enjoy his Japanese host family and friends he made during his exchange. Among other activities, he visited Universal Studios (yes, there’s one there too! 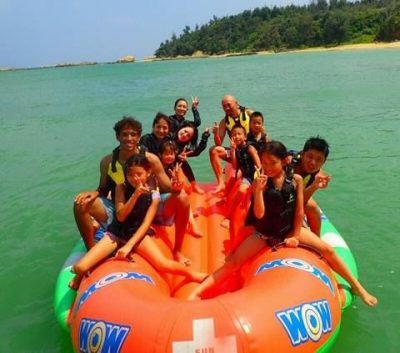 ), and even took a trip with his host family to the beautiful Okinawa Islands. Chris’s exchange allowed him to gain some insights into Japanese culture, and perfect his Japanese language skills. There also were some differences he noticed between Japan and the United States. One big difference, from his perspective, was that Japanese people often seem more organized than Americans, particularly with regard to time. While in the U.S., it may be acceptable to be “fashionably late,” he observed that this would likely be frowned upon in Japan! Despite his busy schedule, Chris still prioritized practicing and learning the Japanese language. In addition to speaking Japanese in high school every day, he attended Japanese language classes on Saturdays, which proved to be very helpful in accelerating his language acquisition. And, of course, he was able to practice Japanese with his host family and new friends. He recommends that the best way to learn the language is to immerse yourself in conversation instead of relying solely on textbooks, and enjoy simply practicing reading and speaking the language! Chris had a great exchange in Japan, and misses his friends and host family dearly. 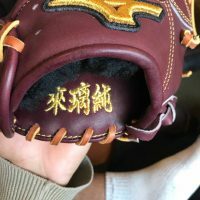 He became such a part of his baseball team that they gave him a beautiful baseball glove, embroidered with his name in Japanese! Chris hopes to return to Japan after high school and hopefully play baseball at the collegiate level. He has even already begun applying to Japanese universities. To have a memorable and successful exchange like his, Chris advises that you start preparing early for an exchange by maximizing your foreign language learning, and by getting involved in as many activities and clubs as possible (especially after you arrive at your high school overseas. He says that this helps you make friends and effectively immerses you in the language and culture. Arigatou, Chris, for sharing your experiences with us!